Sofie Ramos is an installation artist currently pursuing her MFA at UC Berkeley. Below is a reflection on my visit to her studio space at the Richmond Field Station. Bright, dry, and dead silent. 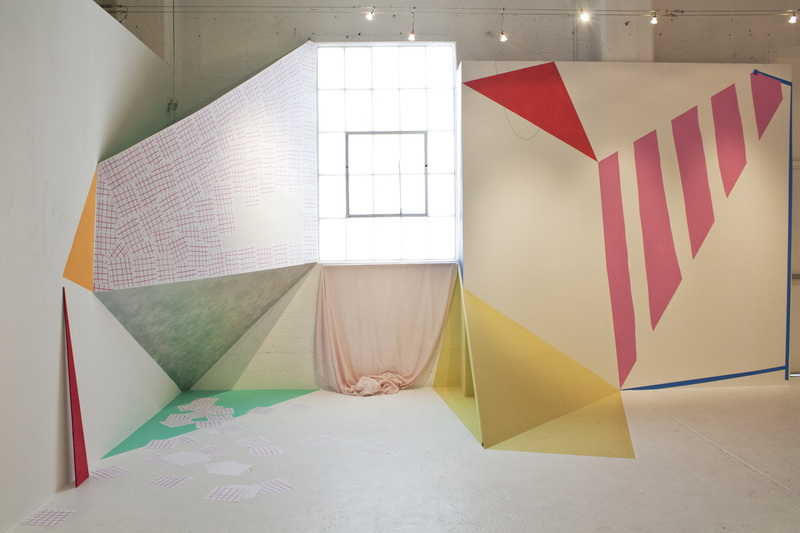 The Richmond Field Station, home of the UC Berkeley MFA studios, seems all but deserted in the middle of a Tuesday, but it’s an idyllic backdrop for installation artist Sofie Ramos to remain undistracted from her studio practice. This fall, Ramos will embark upon her final year as an MFA student. Fresh from completing her BA at Brown University, she decided to forego the typical advice offered to BA graduates: don’t go straight to grad school. Take some time and work on your portfolio. But Ramos felt like she was on a roll at the end of her final year and did not want the pace to drop. During my visit to her studio, she quite eloquently described this decision as a “survival tactic.” Being acutely attuned to the reality of the world, she knew it was the only way she would have the space, time, and resources to keep growing as an installation artist. Upon first looking at Ramos’s work, it becomes readily apparent that the woman needs space. 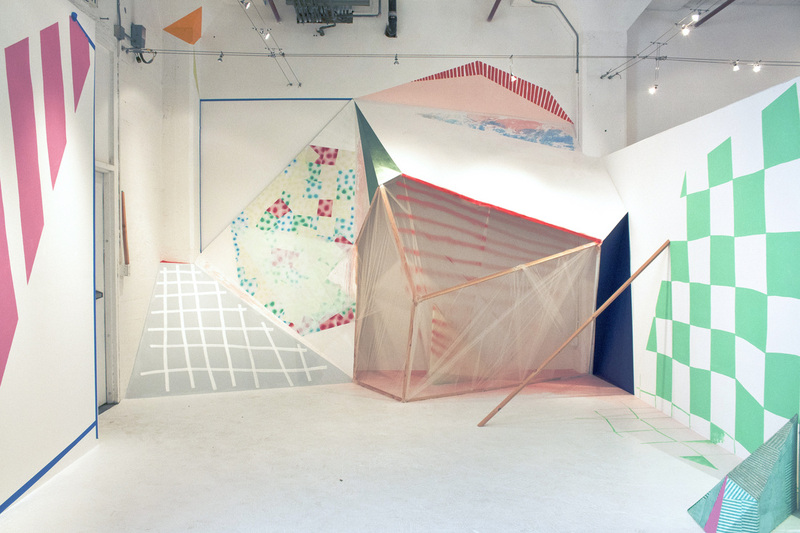 Her large Alice-in-Wonderlandish installations fight against being contained. 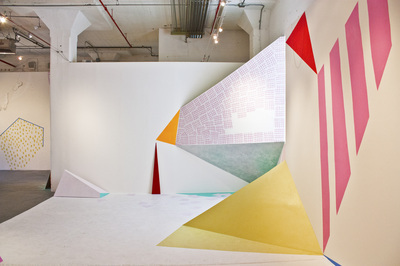 In her most recent work, Ramos reorients the space her installations inhabit by interconnecting drywall constructions with paint and a visually satisfying array of textiles and string. When you let your eyes go fuzzy and allow the installation to flatten, it resembles a delicately balanced abstract painting. So it was no surprise to me when she confessed that early in her practice she had always considered herself a painter. That is, until she got bored confining her work to canvas on a frame. I smirked a bit as I looked over at the charming polygonal frames she constructed and had stretched patches of fabric over (pictured below). Over time her work naturally began to spill out of the frame. She started placing objects outside of the frame, collaging outward and interacting directly with the surrounding space. Ramos talks about her process in terms of making moves. Once given a space to begin building her work, be it a gallery or her own studio cubicle, it has to be a physical process. She found herself initially taking photos of the walls and adding shapes in Adobe Illustrator, but ultimately scrapping these. She says it’s always different when you’re actually there. The feeling is always different. It goes without saying, her process of art making relies heavily upon instinct. She makes moves intuitively. Adding and removing pieces as she goes, she follows what she refers to as a “visual logic.” This makes it very difficult to decide when a piece is truly finished (assuming of course that any art piece is ever really finished). But it is easy to imagine that Ramos’s process has a particular open-endedness. 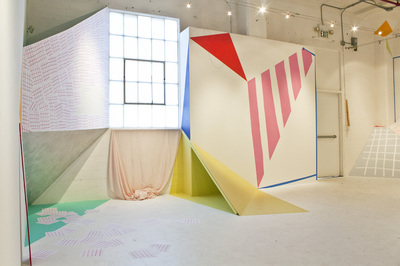 She admitted that she does struggle with the end point, which is often forcibly resolved by the opening reception. This seemingly endless process of adding and removing textural elements speaks to Ramos’s overarching, deliciously refreshing stimulus for making art. It is important to note that she has recently found herself inspired by Existentialist literature and Theatre of the Absurd, siting Jean-Paul Sartre’s “No Exit” and Samuel Beckett’s “Waiting for Godot.” She happily embraces the Sisyphean nature of her process; a delectably absurd adding and removing of pieces with no true end or resolution. Below are images of her climb/crawl installation for her recent Arts Benicia Artist in Residence exhibition. Visit her website to see more of her work.